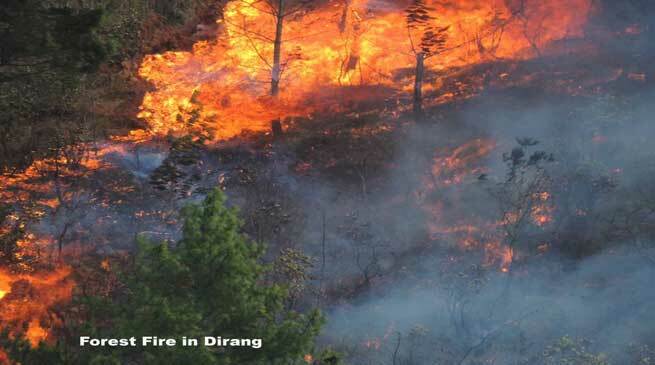 At least two women named Chogymu and Ngawang Choden died and four other sustained serious injuries in a fire which occurred in Dirang on Friday. In the incident, Dorjee Sangyal sustained serious injuries while four others suffered minor injuries. One injured is reported to have been evacuated to Tezpur. As per the report, 5 sqkm of area was consumed by the fire, destroying swathes of land with apple orchards. Chief Minister Pema Khandu has expressed shock over the incident that occurred today at Dirang, in which two women namely Chogymu and Ngawang Choden died. The Chief Minister has expressed his heartfelt condolence to the bereaved family and prayed for giving strength to them to bear the loss. The CM issued directives to the district administration for immediate relief to be provided to the aggrieved. The district administration has also been directed to assess the losses and provide immediate relief, ex-gratia as per the norms.